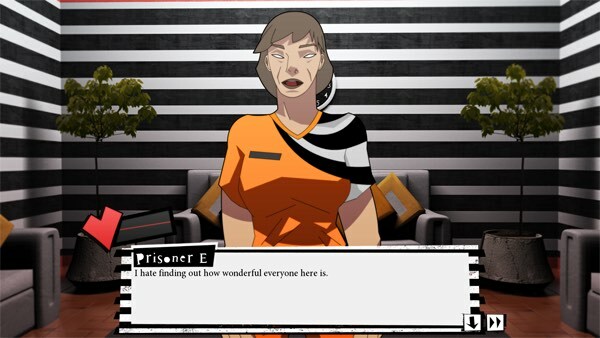 Prison of Lies is a psychological visual novel with puzzle elements, which sees four seemingly wrongly accused prisoners deciding which one of them gets executed. Taking around an hour to play through, Prison of Lies follows four female prisoners who have to decide which one of them gets executed. All four prisoners have been found innocent of the crimes they’re locked up in there for but the prison has to meet their quota of executions so one of them has to be executed (if they’re guilty or not). After being fitted with lie detectors the four prisoners now have to chat with each other to decide which one of them dies. You take on the role of J, the youngest of the four women, who has been locked up for smuggling juice between North and South Korea. It’s a pretty dumb crime to get executed for and you really don’t want to die for it, so you’ll have to plead your case and tell half-truths to avoid getting busted by the lie detector as you try and sway the others votes and make up your mind about who to vote for. Some of the logic seems a little flawed at times, but it’s a thought provoking little game with some fun twists and an interesting premise. Will you be able to figure out who really deserves to die? Note: After the first game over screen press “Try Again” to continue the story (you don’t start from the beginning).